There's a grossly erroneous perception, driven home by Hollywood movies and the narrative of the extreme wingnuts of the left worldwide, that pre-Castro Cuba was ripe for the Castro brothers due to the extreme poverty in the island, corruption, backwardness, disease, illiteracy, etc. "Once upon a time there was a Republic. It had its constitution, its laws, its civil rights, its President, a Congress, and law courts. Everyone could assemble, associate, speak and write with complete freedom. Public opinion was respected and heeded and all problems of common interest were freely discussed. There were political parties, radio and television debates and forums and public meetings. The whole nation pulsated with enthusiasm." He, and his brother, erased that Republic, brutalized it, and replaced it with a Communist dictatorship. In 1829, Cuba was the first nation of Latin America, and also before several European nations, to use steam ships. In 1837, Cuba became the third nation in the world, after England and the US, to build a railroad. It also had the causal effect of creating a significant Chinese immigration to the island. The first doctor to use anesthesia in medical operations in Latin America (and also before Spain, Portugal, Italy, France and many other European nations) was a Cuban. It was ether and the year was 1847. In 1860, in the city of Cardenas, two clinics started the world’s first health insurance projects. Known then as Mutual Benefit Organizations, these MBO's were the precursors of what are known today in the US as Health Maintenance Organizations or HMO's. Membership in one of Cardenas's MBO's gave its members access to all of the then available medical treatments that the clinics offered. As the medical systems and clinics developed, most Cuban hospitals and clinics provided free healthcare to the poor. The first Latin American to play professional baseball in the US (and the “father of Cuban baseball) was the Cuban, Esteban Bellan in 1871. The very first demonstration on planet Earth of an industry powered entirely by electricity was in done in Havana in 1877. In 1881, a Cuban epidemiologist, Dr. Carlos Finlay, was the first to discover the transmitting agent of yellow fever, the mosquito Aedes Aegypti, which now also happens to carry zika. Dr. Finlay studied medicine at Thomas Jefferson University in the US. The first system of electric lighting in all of Latin America, and also before a dozen European countries was installed in Cuba in 1889. The first streetcar in Latin America (and before six European nations) began operation in Havana in 1900. In 1900, before at any other country of Latin America, the first automobile arrived in Cuba. By 1959, there were more Cadillacs in Havana than in New York City. The first Latin American woman to drive a car was the Cuban writer Renee Mendez Cape in 1900. The first Latin American Olympic champion was a Cuban. The gold medal was won by the fencer Ramon Fonst Segundo, in 1900 (he also won a silver in that Olympiad). In 1904 Fonts won three gold medals in fencing! The first Ibero-American nation to abolish bullfights was Cuba in 1901. In 1902, when Cuba finally broke away from Spain, the island had been the source of between 50%-75% of the entire Spanish Gross National Product. The first city on the planet to have a direct dialing telephone system was Havana in 1906. The second city in the world to have a direct dial telephone system was Santiago de Cuba, the capital of the Oriente province. All through the first half of the century, Cuba had more telephones per capita than any Latin American country except Argentina and Uruguay. In 1907, the first x-ray medical department in Latin America (and before nearly every European nation) was established in Havana. On the 17th of May, 1913 the first international aerial flight in Latin America was achieved by the Cuban pilots, Agustin Parla and Domingo Rosillo del Toro. The flight was between Cuba and Bone Key, Florida and lasted 2 hours and 40 minutes. Cuba, in 1918, was the first country of Latin America to grant divorces to married couples. The first Latin American (and the first person born outside of Europe) to win the world championship of chess was the Cuban master, Jose Raul Capablanca. He’s considered one of the greatest players of all time and was world champion form 1921-1927. He only lost 35 matches in his lifetime. In 1922 Cuba was the second nation in the world to have a commercial radio station, and the first nation in the world to broadcast a music concert. By 1928 Cuba had 61 radio transmitters, 43 of them in Havana, giving the nation the fourth place of the world, only surpassed by the US, Canada and the Soviet Union. In 1935 the concept of the radio novel and radio series was created by the Cuban Felix B. Caignet. That was the seminal birth of the telenovela as well! In 1935, the first black man to play professional baseball in the then segregated Major Leagues (and 12 years before Jackie Robinson) was the Cuban player Roberto Estalella. Cuban professional baseball had never been segregated. In 1937 Cuba was the first nation in Latin America (and before most European countries) to establish a legal work day of 8 hours. It also established a minimum wage! In 1940 Cuba became the first country of Latin America (and also before many European nations) to elect politicians by universal suffrage and absolute majority. Also in 1940, when 70% of the Cuban population was white, Cuban voters elected a black Cuban as President (Fulgencio Batista). Batista was the first (and so far only) black President elected in Latin America. In 1940, Cuba was the first nation in Latin America (and before several European nations) to recognize and authorize the right to vote for women, the equality of rights between sexes and races, and the right of women to work. In 1942, the Cuban musical director Ernesto Lecuona became the first Latin American musical director to receive a nomination for an Oscar. The second country in the world with a commercial television station was Cuba in 1950. Throughout the decade, Cubans had more TV sets per capita than any other Latin American country, and more than Italy, Spain, Ireland, and Portugal. Also in 1950, Damaso Perez Prado’s mambo piece Patricia was the number one record for 15 consecutive weeks in the Hit Parade list. In 1951, Desi Arnaz became the leading producer in American television. He also pioneered the concept of a third camera in television programming. A year later, in 1952, the first all-concrete apartment buildings in the world were built in Havana. In 1953, about 57% of the Cuban population was urban and more than 50% of the population lived in cities with more than 25,000 inhabitants, 33% lived in four cities with more than 100,000 inhabitants. In 1953, one-sixth of the population lived in Havana, making it the third-largest capital in the world in relation to the total number of the nation's inhabitants (after London and Vienna). In 1954 Cubans had the third highest meat consumption per capita in Latin America (after Argentina and Uruguay) and higher than most European countries. In 1955, Cuba had the second lowest infant mortality rate in Latin America, 33.4 per thousand born and the third lowest in the world. It ranked ahead of France, Belgium, West Germany, Japan, Austria, Italy, and Spain. In 1955, life expectancy in the US was 66.7 years. Life expectancy in Cuba was among the highest in the world at 63 years of age; compared to 52 in other Latin American countries, 43 in Asia, and 37 in Africa. In 1956, the United Nations literacy report noted Cuba had the second highest level of literacy in Latin America and higher than several countries in Europe. In 1956, according to a U.S. Department of Commerce analysis, Cuba was "the most heavily capitalized country in Latin America" and its "network of railways and highways blanket the country." In 1957, a United Nations report noted that Cuba had the third largest number of doctors per capita (one for each 957 inhabitants) in Latin America, and more doctors per capita than Britain, Holland and Italy. The same UN report also noted that Cuba had the number one percentage of electric access to houses in Latin America (and higher than Portugal, Spain, Greece, Ireland, and all of Eastern Europe and the Soviet Union), and second in Latin America, after Uruguay, in per capita daily caloric consumption (2870 calories per person). This was also higher than all Eastern European nations and three Western European nations. In 1957 Havana became the second city on the planet to have a 3D movie theater and a multiscreen theater (the Cinema Radio Center). In 1957 Cuba had more television stations (23) than any other country in Latin America, way ahead of much larger countries such as Mexico (12 television stations) and Venezuela (10). In 1957 Cuba was first in Latin America, and ranked eighth in the world in number of radio stations (160), ahead of countries such as Austria (83 radio stations), United Kingdom (62), and France (50). In 1958 Cuba was the second country in the world to broadcast television in color. The US, of course, was the first. In 1958, Cuba was the first country in Latin America, and the third country in the world with the most cars per capita (one for every 38 inhabitants). Cuba was also first in Latin America and third in the world with the most electric home appliances per capita. In 1958 Cuba was the first country in Latin America and third in the world (after the US and England) with the most kilometers of railway lines per square kilometer and the second in the total number of radio receivers. In 1958 Cuba had 58 daily newspapers of all political hues. There were 18 daily newspapers in Havana alone. Bohemia magazine, with a circulation of 250,000, was the largest Spanish language weekly magazine in the world. People wanted to immigrate to Cuba – not escape from Cuba! Despite drastic immigration curbs set in place in the 1930s, when European immigrants almost matched the number of natural born Cubans, during the entire decade of the 1950's, Cuba was second in Latin America in the number of immigrants per capita. In 1958, and in spite of its small size, and small number of people (6.5 million inhabitants in 1958), Cuba ranked as the 29th largest economy in the world, ahead of several European nations. 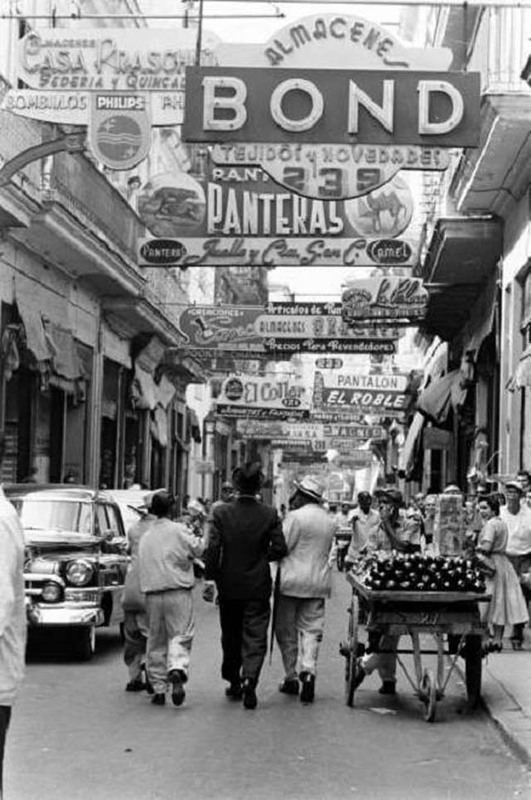 In 1959, Havana ranked as the number one city in the world with movie theatres (358). New York and Paris were second and third, respectively. In 1959, Cuba's gold reserves were third in Latin America, behind only Venezuela and Brazil. Cuba had the third-highest per capita income in Latin America, exceeded only by Argentina and Venezuela (around $550 a year). It was also higher than Italy, Japan, Ireland, Spain, and Portugal and every single Eastern European nation in the Soviet bloc. And then came 1959 and the Castro Brothers’ Workers’ Paradise… Since 1959, over one million Cubans have escaped from the island.